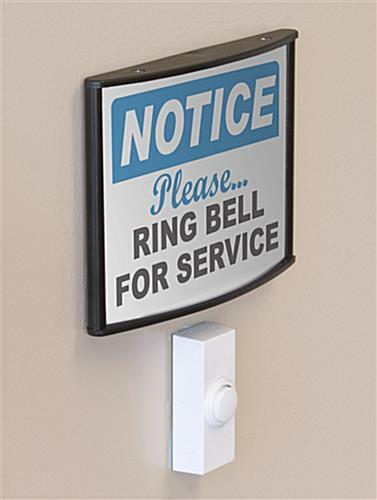 This Office Directory Sign Comes with a Suction Cup for Fast Signage Changes! 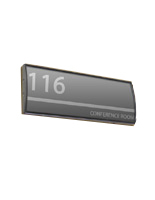 This Architectural Signage Is an Indoor Image Holder Uses Metal Framing for Durability! This Office Directory Sign Is for Fast Shipping! 4.5" x 24" 5.5" x 6" 5.5" x 9" 5.5" x 15" 6" x 7.5" 6" x 8.5" 7.5" x 10" 7.5" x 11.75" 8.5" x 11" 8.5" x 16.5" 11.5" x 17"
Curved architecture of this sign looks modern. Two-sided tape helps with wall mounting. Comes with no-glare lens to proteect graphics from sun damage. This office directory sign is a very convenient unit for companies to use. The way finding holder can be conveniently mounted to the wall using the included to the double-sided foam tape on the rear of the display. 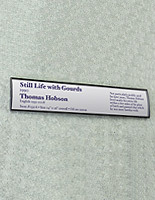 This office directory sign may be affixed either in portrait or landscape orientation on flat wall surfaces. Through presenting company signage within an interior advertising display, visitors are better able to find their desired destination. 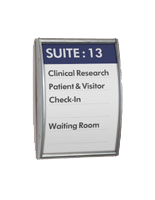 This office directory sign, often called name plating, is wonderful for implementation within indoor rooms like a lobby, hallway, vestibule or other multipurpose area. 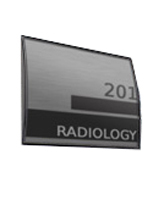 The corporate signage display comes in different dimensions and styles. 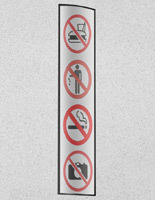 This office directory sign has related items that may be browsed in the right column. 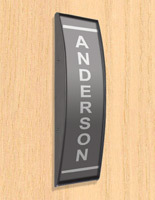 The name plate signage is sure to make a big impact on visitors trying to find their way around the establishment. 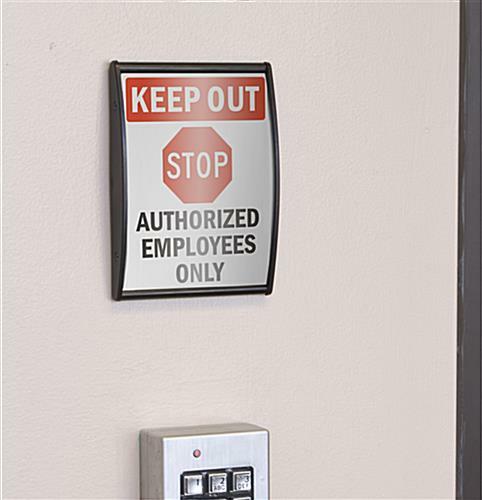 This office directory sign, similar to directional signage, is a cheap option for buildings trying to aid guests or new employees learn their way around. 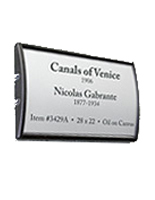 The display is manufactured with end caps that are plastic and anodized aluminum for durability. This office directory sign features a custom concave shape that is certain to attract interest to the messages within the holder. 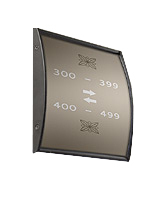 The architectural signage display includes a non-glare lens front which stops glare from preventing audiences from viewing the images or information. This office directory sign, sometimes called a wall frame, permits users to quickly alter the images. The signage includes a suction cup, which allows users to open the front and slide-in the newest messages. This office directory sign does not come with any artwork or images. However, users can make their own messages with the help of home printers.